Yesterday was a real treat for those attending this year's meeting of the Canadian Archaeological Association -- a full day of papers from both land-based and underwater experts giving background as well as the latest discoveries in their collective work on the fate of the Franklin expedition. The speaker's list offers a who's who of the foremost archaeologists in this field: Ryan Harris, Marc-André Bernier, Anne Keenleyside, Doug Stenton, and Robert Park -- along with several of the conservators and curators who are working with the recovered objects. Karen Ryan, the lead curator of the large exhibit which will open this July at the National Maritime in Greenwich, and arrive in 2018 at the Canadian Museum of History in Gatineau, was joined by Claire Champ, Danielle Goyer, and Kerry McMaster in a joint preview of the exhibit, which -- at 6,500 square feet -- will be the largest one of Franklin-related materials in more than a century, and the first to feature newly-recovered relics. Perhaps just as notable was the presence of David C. Woodman in the audience, since his work on the historical Inuit testimony was in many ways the key that unlocked these previously hidden histories. • Although an anchor cable seen stretching out from HMS "Terror" was once thought to be evidence that it had been anchored at the site, it appears that this anchor is still aboard ship; the cable had simply played out from the windlass. Parks was able to get some quite good imagery via ROVs and early spring dives through the ice. • The propellor compartment on Terror was filled with a wooden block, so the propellor was not deployed -- making the presence of what's been thought to be the exhaust pipe of the steam engine still more of a puzzle. • A previously unidentified object in the vicinity of Terror has been identified as a ship's cutter boat with clinker construction. Oars on top of the port side ice channels were noted; she was 23 feet long. • The first focus of work involving the recovery of objects may well be HMS "Erebus," due to the fragile condition of the wreck and its vulnerability to currents or passing ice in its shallow resting place. Already, much of the upper and lower decks have collapsed onto the bottom. • Jonathan Moore stated that there was as yet no evidence of Inuit scavenging of HMS "Erebus." • Charles Dagneau showed images of graffiti and cut-marks on plates, possibly marks of ownership similar to those found on silverware. Based on an initial assessment of this evidence, the officers and sailors seem to have interacted more closely than might otherwise have been imagined. • As they've said all along, the Parks Canada team feels that there's a very good chance of recovering written documents. A key question will be to establish a timeline -- which ship was manned (if indeed both were), and which abandoned first, and how and when were they connected to sites on land? • In terms of archaeological work on land, Doug Stenton is still hoping to identify the location of the "Tent Place" at Terror Bay, now that we know where Terror is. • Anne Keenleyside gave a presentation on her work (with Stenton and Park) on DNA recovered from the bones of Franklin expedition members. As has been noted here and elsewhere, the most significant revelation of this study has been that a much higher number of individuals met their end at Erebus Bay than had previously been thought. This weekend, I've had the opportunity to visit the home of an old friend, John Rae, "The Arctic Traveller," one of the most capable and steadfast explorers ever to venture into the Frozen Zone. I'm enormously grateful to the John Rae Society for bringing me over, and inviting me to give a series of talks to the public, as well as to local colleges and primary schools. Their Rae Festival is only about halfway through, but already I have met more people of extraordinary character, kindness, and genuine interest than I've had the pleasure to encounter at nearly any other place I've visited. John Rae's father, who worked as the Hudson' Bay Company's representative in Stromness for many years, is said to have recruited so many locals that at one point, 75% of the HBC's workforce were Orkneymen. Though not "gentlemen" in the conventional sense, a better company of adventurers can scarcely be imagined. The Society organized two open days at the Hall, both of which (despite the second being a tad blustery) were very well attended indeed. The tours went so frequently that my host, Andrew Appleby (the society's president and chief tour guide) was obliged to turn around and give another the moment he returned from the previous one. There is much that needs doing -- the society's tent included a copy of the latest building survey -- but the first tasks are especially urgent: controlling moisture, evicting the pigeons, and stabilizing the floor and roof. Contributions have been abundant over the weekend, but much more is needed; the more solid a foundation the society can lay, the better the chance of more substantial grants further along. 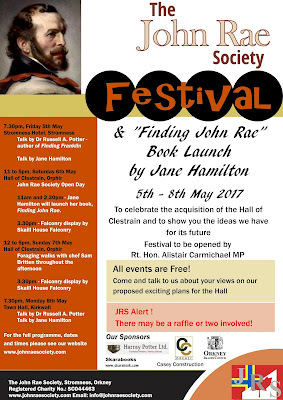 I was also, on this occasion, delighted to meet Jane Hamilton, Rae's great-great-grand-niece, whose extraordinary novel Finding John Rae takes up the explorer's tale in the first person, re-imagining his journeys as only he experienced them. She brought her family with her, including several cousins, all of whom convinced me anew that the line of John Rae is one of perseverance, courage, keen observation, and -- above all -- kindness. This evening, I'll be on a series of flights that will take me to Kirkwall in Scotland's Orkney Islands, where I'll be among the speakers this year's festival, sponsored by the John Rae Society. The main events are listed on the poster shown here; a more detailed schedule can be had online here. I'm looking forward tremendously to meeting the good people of the Society, as well as novelist and Rae great-grand niece Jane Hamilton, whose new book Finding John Rae is to be launched at the festival. There will also be copies available of my own recent book, Finding Franklin, along with the late Garth Walpole's Relics of the Franklin Expedition, which features images of many of the relics brought back by Dr. Rae, both on the cover and within its pages. I'll be giving two talks: first, on Friday in Stromness, "The Habit of Exact Observation: Dr. Rae's Discovery of the Fate of Franklin," and then on Monday in Kirkwall, "Things Worthy of Record: The Legacy of Dr. Rae." As the titles suggest, the first talk will focus on Rae's 1854 discovery of the Franklin relics, along with Inuit testimony as to his men having turned to the "last resource"; the second will highlight Dr. Rae's contributions later in his life, including his consulting with the American Geographical Society on plans for the Schwatka expedition in 1878. Each lecture will feature some new images and letters never previously published or known: in the first, detailed imagery of Rae's own personal collection of Franklin relics; in the second, a series of letters between Rae and other Arctic luminaries, along with letters written by his widow Kate in the time just after his death in 1894. I hope that who can will join me at one or both of these talks, and who have an interest in the career and accomplishments of Dr. Rae, will find that they renew and freshly kindle their admiration.